Even with the dual monitors and an effective 3200×1200 resolution I still love using Spaces. Activating that through either the mouse or keyboard and swiftly navigating between spaces is now second nature to me. In Windows I always used Alt-Tab to switch between applications; while I occasionally use Command-Tab to do that on my Mac it’s usually only to toggle back and forth between two applications quickly. If you look at the image above you’ll see that I’ve got 6 spaces to work with. I’m still tweaking that but I had a tendency on the MacBook to keep specific apps in certain Spaces and I’m continuing to do that with the Mac Pro. 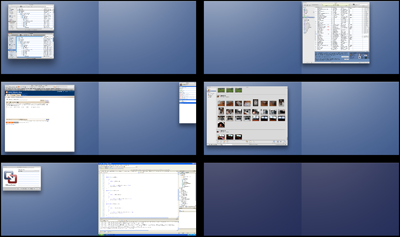 At the bottom left is the Space I have dedicated to VMware Fusion and Windows XP. Fusion allows you to operate in one of three modes: Full Screen, Unity and in a window. The window view places your XP instance into a resizable window that lets XP think it’s in a monitor of that size, which means if you resize the window to 640×480 then XP thinks it’s operating on a 640×480 sized display. Unity mode, which is really interesting, places the applications from your Windows XP instance directly into your Mac environment. I tried playing with it and didn’t care for it as much as I thought I would. There are a couple of little UI artifacts on the applications I tried running and it just seems odd having older Windows XP style windows sitting in OS X. It feels like being in a brand new car but looking down at the stereo controls and finding something that came out of a 6 year old car. Well, maybe not quite like that but it does feel odd. Now I still have access to my Mac’s menu bar even though I’m in Windows XP in full screen mode, making iStat visible at all times. I’m still spending time tweaking this but it’s starting to settle into this configuration. My friend Bradley is a heavy duty Quicken user and has been really disappointed with the Quicken version for Mac. He is down to only a couple of applications that he continues to depend on Windows for and Quicken is one of them. Can anyone recommend a decent replacement for it that is native to Mac? I’d personally like to find something as well, ideally one that interfaces well with my bank and credit card providers. I’ve spent zero time looking but have gotten such great tips from people here I’m hoping someone has a good recommendation. Interesting article, thanks (I know it’s been a while). Thanks for pointing me to iStat Menus – great resource-monitoring utility. I have a 3-monitor setup, and would love to use Unity mode – unfortunately, though, it is an unmitigated disaster – ‘ghostly’ duplicates of windows appearing, windows getting ‘corralled’ in an area far smaller than the display at hand, windows not receiving input focus when activated via keyboard shortcuts. VMware knows about these issues, but no fix has materialized yet. I have yet to find a suitable Quickbooks substitute.